Rubbish - it's a topic we all have an opinion on. From bin strikes & local authority budget cuts to harmful plastic waste and confusing recycling rules. Helen Skelton asks the questions: Are we reaching tipping point with our waste, and what needs to be done to sort it out? Plans for Birmingham City Council to restructure their bin collection service and save millions of pounds led to a series of strikes by bin collectors. This in turn impacted the streets with vast mountains of rubbish piling up attracting fly tippers who added even more waste to the heaps of rubbish. 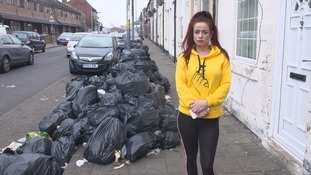 Residents of Birmingham - like Helen Jackman - have had enough. It’s not just towns and cities that are facing problems with waste. Ed Ford’s farm in the Essex countryside is having an issue with illegally dumped waste - almost 40 tonnes a year that is costing him up to 10 thousand pounds annually to clear himself. “It’s of epidemic proportions in this part of the world, you talk to any farmer round here. Despite nearly a million fly tipping incidents in England last year the situation hasn’t been helped by charges introduced at local waste recycling centres, opening hours at these centres being cut and others actually being closed down. Councils are trying new ways to get us to recycle more. In many areas - weekly rubbish collections are now a thing of the past. Having fewer bin days saves money, but is also aimed at improving recycling rates. However not all areas are reaping the rewards of eco-friendly decisions. Some like the coastline at Lynemouth are feeling the effects of damaging decisions that were made years ago. For decades this coastline was a dumping ground for waste from local collieries and tonnes of industrial and fly-tipped rubbish which was eventually covered over to create sand dunes near the sea. But eroding land is now revealing the waste buried inside - which is gradually seeping onto the beach and into the sea. “With the high seas it’s pulling down the bank and all of it is being washed into the sea. This is all happening in a location that is a marine conservation zone. The impact of our waste is not only being felt on British shores but much further away from home. Much of our plastic waste ends up in countries in East Asia like Indonesia. Emma Priestland a campaigner from Friends of the Earth has recently been to Java to see the impact its having there. “We might be, carefully sorting our waste at home looking at the sign on the packaging and it's got the little recycling symbol. It might be technically recyclable but whether or not it's actually economically recyclable, whether it makes any money you know that's a different matter.